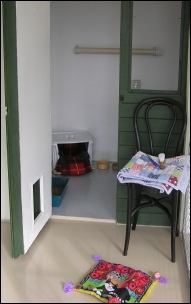 The accommodation offered at Mulligan’s Meadow Boarding Cattery comprises of 24 individual purpose built chalets. At the time of construction we had two very different pet cats. their individual run, they remain totally secure until returned to their own accommodation. Because we wouldn’t expect our boarders to holiday in a ‘tunnel’, we have opted for a 2 foot gap between the mesh runs, allowing free flow of fresh air, to act as the required sneeze barrier instead of full height walls or perspex sheeting. This way cats can feel they have the company of other boarders and often adjust more readily learning to relax, play or simply observe in their individual space. The chalets are approximately 1.5m x 1.25m in size. Inside each individual chalet, your cat(s) benefit from the heat of a bar radiator which radiates heat throughout the chalet itself rather than a heat lamp which provides only ‘spot heating’. Each chalet has a window with a shelf just inside so that your cat(s) may view all the goings on without venturing outside should they wish. Each chalet has a full height door for human access which remains closed most of the time. 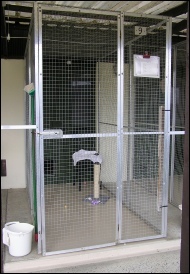 Your cat, of course, has it’s own ‘cat size’ door, which provides daytime access to the run (approximately 2.2m x 1.25m). The cat door is locked after dusk to provide safety and security during the night. 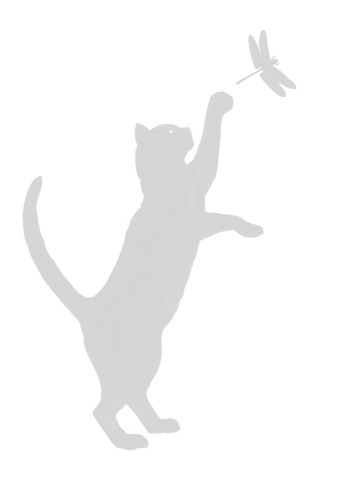 All chalets and runs look out on the cattery gardens and beyond, so that our boarders may watch the birds, butterflies and other country wildlife whilst remaining safe and secure.